Over $90 million was spent on Australia and New Zealand’s finest bred and conformed yearlings offered at the 97th Inglis Australian Easter Yearling Sale that concluded in Sydney on Thursday. Demand was high for the cream of the regions’ yearling sale crop, with the sale average and median up 32% and 25% respectively on corresponding figures from last year. “The fantastic results recorded are a clear endorsement of the strength in both the local industry and the respect that the international community has for our product,” Webster said. Fireworks from the first two days continued this morning with strong competition on a number of lots, including Kitchwin Hills’ filly by Redoute’s Choice from Group 2 winning dam Vormista (Lot 399) which was purchased for $900,000 by James Harron Bloodstock. Shadwell Stud’s racing manager Angus Gold added Willow Park Stud’s colt by Redoute’s Choice from Zarzuela (Lot 416) to his list of Session One purchases. Shadwell Australia finished as the leading buyer of 21 yearlings for $8,270,000. Champion stallions Redoute’s Choice and Fastnet Rock had super Easter sales. 65 yearlings by the pair accounted for $38,990,000 in sales in Session One. The Liston family's Three Bridges Thoroughbreds finished at the top of the vendors list by average, highlighted by the record breaking sale of Black Caviar's half-brother for $5,000,000. "On behalf of Inglis I would like to thank the Liston family for the manner in which they carried themselves through the entire process of selling the Helsinge colt. There was a lot of pressure placed upon them and they displayed true professionalism," said Webster. "Much thanks must also go to Rick Jamieson who has entrusted Inglis to sell all of Helsinge's outstanding progeny over the past five years," Webster added. Cressfield Stud drew plenty of praise from buyers, which spent an average of $1,360,000 on the stud’s 5 yearlings sold, highlighted by the Fastnet Rock colt from Group 1 winner River Dove (Lot 295) purchased by Emirates Park Stud for $4,000,000 yesterday. Coolmore Stud finished at the top of the vendors list by aggregate having sold 33 yearlings for $9,645,000 in Session One. Alex Kingston accepted Kia-Ora Stud’s prize from Luxbet for the best prepared draft at this year’s Easter Sale. Kia-Ora brought 11 to the sale and sold 9 at an average of $536,667, with the highlight being the Fastnet Rock x Dream Play colt (Lot 82) which was sold for $1,500,000 to Tom Magnier for Coolmore / China Horse Club. Session Two of the Inglis Australian Easter Yearling Sale continues to grow its following, with this year’s session recording 18% and 31% increases in average and median prices attained for vendors. 74 yearlings were sold in Session Two on Thursday for $6,452,000, with a new record price set when Haunui Farm’s colt by Street Cry from Fashionable Lass (Lot 557) was purchased by Mark Kavanagh for $380,000. 27 yearlings were sold for $100,000 or more in Session Two this year, compared to 20 last year. Group 1 winning Easter graduates have ranged from sale topper All Too Hard to $27,000 purchase Fat Al this current racing season and Inglis Bloodstock Director Jonathan D’Arcy believes Easter's record of rewarding buyers throughout the buying spectrum will continue with this year’s crop. “I’ve got no doubt there will be a high number of stakes winners come from yearlings of Easter 2013 given the outstanding level of pedigree and type that the breeders entrusted us with,” said D’Arcy. 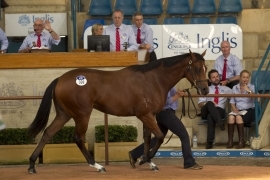 Horses passed in during the 2013 Inglis Australian Easter Yearling Sale are available for sale via the Inglis Make-An-Offer Service.